Tarchin Hearn, international meditation teacher, speaks on refuge in the heart breath of timeless living. In this 50 minute interview recorded in 2010, Tarchin introduces his unique transmission on developing a sense of refuge through sensing and opening to a spacious awareness of 'presence' to the worlds of 'being', flowing from our ancestors through us into new forms of life. His emphasis is on 'looking with eyes of interest' and non-clinging awareness that will soften the negativity of anger, fear, jealousy and ignorance. Tarchin is the prime meditation teacher at Wangapeka Retreat Centre in New Zealand but also teaches around the world, particularly in Australia and Canada. 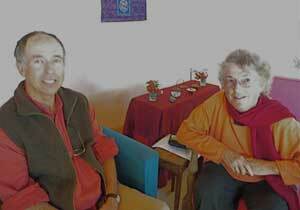 Tarchin has more than 30 years experience in the Theravadin and Mahayana schools of Buddhism. He was a monk for 12 years and has now developed a unique but universalist style of teaching that blends the understandings of ecology and science with Buddha Dharma. He is also an artist, poet and author of several books. Tarchin's language is poetic and soaked with compassion and wisdom. He blends the universalist teachings of the Ven. Namgyal Rinpoche, his root guru, with the teachings of Thich Nhat Hanh; renowned Burmese and Tibetan Theravadin, Mahayana and Vajrayana masters; and the scientific observations gained from extensive study of our environment, on micro and macro levels of being. In summary, this interview is structured around discussion of his unique expression of the essential meanings of Foundation Work - the Ngondro of Tibetan Buddhism - in which he suggests Foundation Practice as an exploration of the foundation of being (Refuge), leading to an awareness of what blocks that flow (Vajrasatva or purification practice) through to an increased awareness of giving and receiving (mandala practice) and eventual understanding of union (guru yoga practice). For anyone practicing Ngondro, this is an interview not to be missed. It is also a really valuable interview for those listeners who find aspects of Mahayana and Vajrayana Buddhism difficult to engage with.